This week we’re featuring Noel Phoenix! Sometimes, the name given to an animal is chosen quickly, based on a beloved fictional character they remind us of, a pet we knew as a kid, or a physical characteristic of the animal. Other times, we craft a name chosen based on that animal’s spirit, and that’s how Noel Phoenix was named. 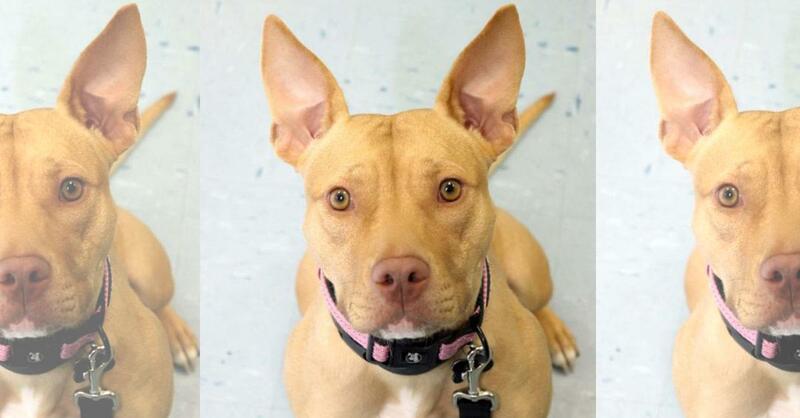 This 1-year-old pit-mix got her name by rising from the ashes: found at a construction site this past winter, she has been lovingly fostered and is rising to the challenge of learning to trust humans again. You see, after being neglected and abused, Noel Phoenix experiences separation anxiety when her foster dad leaves her. Through training, love, and a little medication, she is doing much better with crate-training–she will enter her den willingly now…though sometimes she can be seen on the pet camera breaking out of the crate to nap on the couch and greet her foster dad at the door! When her humans are home, Noel Phoenix enjoys a game of fetch (which may or may not turn into a game of tug-o’-war), learning new tricks (complete with treats, please! ), and snuggling. She is a clever girl who will be loyal, affectionate, and protective of her forever family. Will she meet her new family soon? We sure hope so! Learn more about Noel Phoenix and apply to adopt at SecondChanceNC.org. Copyright © 2016 WKIX-FM. All Rights Reserved. Internet Development by Triton Digital.